Once your desires and wishes appear in your dreams, they can either bother or motivate you. Arang-Ga is a pansori-style musical. Pansori is a Korean musical genre performed by a singer and a gosu (drummer). This unique element adds a traditional Korean vibe to the musical. Arang-Ga was inspired by Domi Mythology, which is a myth in the Chronicles of the Three States. Except, while the Domi Mythology focused on Domi and her husband, this musical unravels the story with its main character as King Gyero. Throughout the musical, it encourages the audience to ask themselves the true meaning of life, love, and time. Eventually, it reaches the conclusion that all three things are similar in that they cannot be held back or stopped by force. 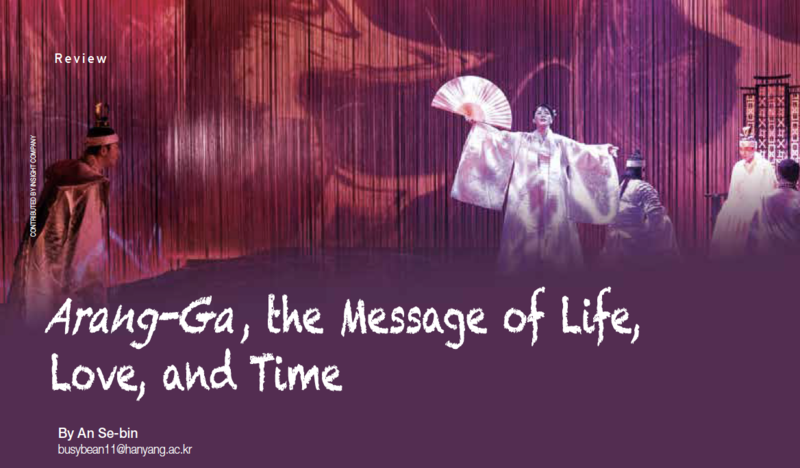 From the days of Baekje in the year 475, the main character of this musical is King Gyero. He had been cursed since he was a prince. The curse is that once he becomes king of Baekje, the nation would collapse in the end. Every night he suffers from nightmares as he is reminded of his curse. However, at the end of each dream, King Gyero sees a mysterious woman who sings a beautiful song. This woman brings comfort to the king, leading him to feel hopeful that his life will come to peace once he finds her. In King Gyero’s life, there are two subjects that advise and protect him. The loyal Domi is a soldier who is popular among the Baekje people for leading and winning the battles that faced them. The other advisor is Dorim, a monk with a mysterious appearance who puts emphasis on strengthening the inner system of the kingdom rather than striking other kingdoms through wars. With conflicting court advice made by the royal court and the continuous threats from the king of Goguryeo, there is not a day when King Gyero can sleep soundly. As the current state of affairs with a nearby country keeps becoming more serious and threatening, King Gyero relies more on the woman under the veil in his dreams. He later confesses to Dorim about the woman in his dreams. Dorim interprets the dream as a god, looking over Baekje, trying to give King Gyero peace. Then, Dorim promises the king that he will try his best and eventually find out who this woman is. Meanwhile, after a busy workday, Domi spends time with his wife, Arang. They promise that one day Domi will end his service, and then they will live happily in the countryside without worrying about current affairs or feeling held down by responsibilities. Domi and Arang also live with Sahan, a young boy who learns martial arts from Domi. Although he has some problems speaking due to his stutter, he is always grateful for the couple and is portrayed as an innocent character. King Gyero’s curse activates once he learns that the mysterious woman under the veil in his dreams is Domi’s wife, Arang. The song he hears every night is a song that Arang sings, Arang-ga, named after her by her mother. King Gyero struggles between morality and desire as he wants Arang by his side although she is a married woman and her husband is his loyal soldier. Dorim, on the other hand, sees King Gyero's desires as an opportunity to strike down Baekje, as Dorim turns out to be Goguryeo̓s spy. He feeds King Gyero with tempting ideas of how the king should take Arang away from her husband and keep her. Dorim interprets the King’s dreams and tells King Gyero that the reason Arang keeps reappearing in his dreams is actually a sign that Domi is a spy for the other country, leaking private military secrets. King Gyero is not convinced at first by this interpretation but as his desire for Arang grows, he accepts it and decides to send Domi away to the borders of Baekje. When Domi hears the news, he is confused at first, but responsibly still takes the job as he really wants to serve what is good for the country. When Domi is given this new task, Arang worries for his safety. Her intuition is proven correct when King Gyero comes to her with Dorim accusing her husband as a traitor after Domi leaves. Meanwhile, Domi witnesses how the people of Baekje are dying with their eyes open and how lacking their military systems are. With the help of Dochang, a narrator who explains the story to the audience and who also foretells the future to the characters in the play, Domi learns how clueless the kingdom has been while its people have been suffering. Realizing that Domi could be in trouble, Arang sends Sahan to deliver messages to Domi. Arang tries to be wise and stays loyal to her husband by trying to convince King Gyero not to follow his desire. She tells him how the people of Baekje will not follow a king who steals his soldier’s wife. Being very disappointed in how King Gyero is behaving and very worried for her husband, Arang explains that it is not the first time they have met. When King Gyero was a young prince wandering in the forest, he ran across Arang. Arang, seeing how lost he was, tried to comfort him by singing the Arang-Ga. By explaining the reason for her appearance in his dreams, Arang confronts the king saying she is disappointed in how he turned out because the prince she remembers crying in the forest had innocent eyes, full of hope. However, King Gyero’s eyes are clouded with wrong desires and ambitions. After listening to the story Arang tells him, King Gyero’s love for Arang grows, and he becomes more certain that he has to have Arang by his side. As King Gyero’s decisions are against Arang’s wishes, she feels very troubled for the future. Meanwhile, as Sahan is on his way to deliver a message to Domi, he comes across Dorim. Revealing his true identity to Sahan for the first time, Dorim attacks Sahan, injuring him. With the important message of who was behind the framing, Sahan runs back to Arang to do what he can before he dies. Besides the entertaining storyline, the staging performance of this musical is another feature to focus on. It is simple yet meaningful. Behind the main stage, there are thread curtains on all three sides. The lights that shine on the threaded curtains make it look as if the stage itself is delivering a story to the audience. Another unique composition of this musical is the element of pansori. The narrator also periodically explains the musical to the audience through what each character is feeling in their dialogue. The musical numbers do an excellent job of delivering the entangled emotions of these characters, leaving a feeling that lingers in the hearts of the audience even when the musical is over. Arang-Ga leaves the audience with a sorrowful yet true message of life, love and time. Just as King Gyero tried so hard and yet failed to make Arang stay by his side, real-life situations do not always go the way people planned. The mysterious and yet exciting part about life is that one never knows what awaits. To some, this may seem frightening, but it can also be something to be excited about. By reminiscing the fall of the main character that happened due to his obsession over what he could not control, the audience is invited to consider letting go of obsessions and allowing events to take place as they happen. Sometimes the best presents in life come when no one expects them.